Carnegie Mellon will offer several courses of study leading to a master of science degree in information technology at its West Coast campus (www.west.cs.cmu.edu) in Shenandoah Plaza at the NASA Research Park in Moffett Field, Calif., starting in the fall of 2002. The program is designed to cater to Silicon Valley professionals, preparing them to provide skilled technical leadership and an informed strategic vision in the workplace. Raj Reddy, University Professor of Computer Science and Robotics at the School of Computer Science (www.cs.cmu.edu), is the director of Carnegie Mellon's West Coast program. President Jared Cohon called Reddy a "giant" in the field of computer science. "He'll be a great leader on our West Coast campus," Cohon said. Reddy was founding director of the university's Robotics Institute from 1979-91 and dean of the School of Computer Science (SCS) from 1991-99. He received the A.M. Turing Award in 1994 for his work in artificial intelligence and human-computer interaction. As a member of the President's Information Technology Advisory Committee, he served as its co-chair from 1999-2001. "We are very excited to offer this professional master's program at our Silicon Valley campus this fall," Reddy said. "We believe that Bay Area professionals will find great value in a high-quality educational program that stresses real-world engineering and management issues, and challenges students are likely to encounter in the workplace." Carnegie Mellon's West Coast education program is designed to accommodate the needs of full- and part-time students and will include several specialties, like software engineering, electronic commerce and information management. In time, additional areas of study will be added, depending upon student interest and demand. Carnegie Mellon seeks to offer new educational programs in Silicon Valley that play off of the university's distinctive, interdisciplinary strengths in information technology. Unlike traditional master's degree programs, Reddy said, this program will be built around project-oriented, apprenticeship-based, individually mentored activities that emphasize teamwork and collaboration. Each student will complete a significant practicum or studio project as part of the coursework. The courses to be offered at the West Coast campus are based on the interdisciplinary strengths of the main campus in Pittsburgh. The program will emphasize a learn-by-doing approach that consists of an integrated series of detailed and authentic projects that allow students to complete analyses, solve problems, create project deliverables and put their new capabilities into practice immediately. The faculty will include experts from Carnegie Mellon's main campus, along with world-class professionals from the Silicon Valley business community. They will be available to provide mentoring and feedback on a just-in-time basis to support students at the time of optimal learning. Last summer SCS named Brian Reid as its first faculty member to be headquartered at the West Coast campus. For the past 12 years, Reid has worked in industrial research and development organizations in Silicon Valley. "As a principal research scientist, Brian is going to teach in our dependability projects," said SCS Dean Jim Morris, who has been instrumental in the West Coast initiative. "He brings broad experience in software development, strong academic credentials and an outstanding track record in industrial R&D to this new position." Morris believes that Carnegie Mellon's presence in Silicon Valley will not only make its offerings more accessible, but will enhance the educational experience of students at the Pittsburgh campus by giving them opportunities to participate in research internships at NASA or Silicon Valley companies. 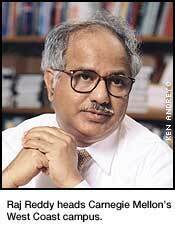 He also noted that about 2,500 Carnegie Mellon alumni live in Silicon Valley. Applications for courses to be offered in the fall at the West Coast campus are now being accepted. Full-time students can usually complete the master's degree in one calendar year or three semesters. If taken on a part-time basis, the program will require two to three years to complete. Carnegie Mellon has been planning its West Coast activities for the past two years. In December 2000, the university formed a High Dependability Computing Consortium with NASA and 15 major information technology companies to address dependability problems affecting computer systems. This past January, the School of Computer Science received a $23.3 million cooperative agreement from NASA to develop a multi-disciplinary High-Dependability Computing Program to improve NASA's capability to create dependable software. Carnegie Mellon experts will collaborate with NASA scientists and researchers from the Massachusetts Institute of Technology and the universities of Maryland, Southern California, Washington and Wisconsin. This summer, as part of its educational outreach effort, the university's West Coast campus and NASA's Ames Research Center are co-sponsoring a seven-week robotics summer course for high school juniors and seniors called "Robotic Autonomy" (www.west.cs.cmu.edu/~robocamp). Under the guidance of Carnegie Mellon Assistant Robotics Professor Illah Nourbakhsh, 30 students will build and program a vision-based autonomous mobile robot that will be presented with challenging tasks throughout the summer. At the end of the course, students will be able to take their robots home to continue to experiment with them. 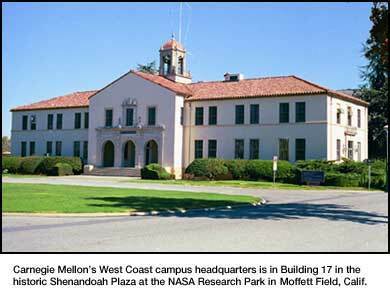 Carnegie Mellon has a long-standing and fruitful research relationship with NASA Ames that goes back more than a decade. Researchers from each organization have collaborated to develop high-profile robots such as Dante, which explored the interior of a volcano, and Nomad, which discovered meteorites in Antarctica. In addition, researchers from departments as diverse as philosophy, computer science and mechanical engineering have worked with Ames researchers on projects such as formal methods for verifying digital circuitry, vision and navigation, machine learning and data mining. Carnegie Mellon plans to lease and renovate one or more historic buildings in the Shenandoah Plaza to house its research and educational programs. Other partners in the NASA Research Park include the University of California at Santa Cruz, San Jose State University and the Computer History Museum. There are plans to build an astrobiology laboratory in the Research Park, and to seek corporate partners as well as university and nonprofit partners. NASA officials envision the Research Park as a unique institution in the heart of Silicon Valley, where researchers from universities, government and industry would work in an intense campus environment to pursue individual and joint interests in science and technology.